What Are The Best Horseriding Jeans On The Market? Proper trousers to ride in, or jodhpurs as they are more commonly known, are essential for comfort. This is because riding trousers don’t have a seam down the middle where most trousers do, which means that your seat, the area on which you will feel the most pressure, will be comfortable and not sore and rubbed by the end of a long ride. But what if you are not keen on the traditional jodhpur style, or you want a pair of riding trousers that are a bit more comfortable, and like, well, jeans? This is a quality pair of riding jeans. They are made from a hardwearing Cotton and Polyester mix, with a touch of Spandex to allow a bit of give. They come in an attractive pre-faded colour too, so you won’t have to wear and wear them to remove that “new” look. Machine washable – This may sound like a small, unimportant plus point, but having riding jeans that can be chucked in the washing machine as normal after a long ride, without having to worry about shrinking or damaging them, is a real bonus. Designed with riders in mind – These jeans were made for, and tested by, riders. This means they will be perfect for riding, and everything that goes with it. Stretchy but strong – The small amount of Spandex in the mix means that these jeans have a bit of give and will be comfortable, as well as being strong and durable thanks to the Cotton/Polyester mix. No-gap waistband – There is nothing more irritating than getting a breeze around your midriff because the waistband is loose and baggy! The contoured waistband of these jeans keeps them snug around your middle. Ariat’s sizes tend to be on the large size – It may be worth ordering a size smaller than you usually wear, or risk having to return them for a smaller pair. For a great pair of riding jeans from a trusted brand, you won’t go far wrong with these. Although they are on the pricey side, they are well made and very high quality, so will last you a long time. Think of them as an investment! A little different from the standard skinny fit of most riding trousers, these are bootcut. Perfect for short boots but you can still wear them with long boots; simply tuck the excess material inside. Strong, hardwearing and stretchy fabric – A mix of Cotton, Rayon, Polyester and Spandex makes these jeans durable enough to stand up to hard riding, while being comfortable to wear. Elastic waistband with button closure – Having a waistband that will not flap in the breeze is important for comfort, as it will stay put no matter what position you are in. The button fastening means there is no potential for a zip to break! Two front pockets as well as back ones – Pockets are so convenient, especially when riding, as it means you can carry a phone without having to carry a bag. Flat seams for riding comfort – There is very little that is worse than a badly placed, raised seam digging in when you’re riding! These jeans are designed for riders, so the seams are flat and unobtrusive. Sizes can be on the large size – Riding jeans are meant to be tight; this prevents potential rubbing and pinching. With that in mind you may wish to order a smaller size than you are used to, to avoid disappointment. A great pair of riding jeans that stand out from the rest due to the unusual cut. Comfortable enough for hours of riding, and stylish enough to wear out to the pub afterwards! A versatile pair of riding jeans, great for heavy barn work as well as hours of riding. They are well made and strong, as well as being comfortable and flattering. Strong and durable, yet also has give – The Cotton/Polyester/Spandex mix is perfectly balanced so the jeans are hardwearing but also have enough give to allow easy mounting. Mid rise for comfort and coverage – Bear in mind that when you are in the saddle your body is in a different position to on the ground, so having jeans that come up high enough to avoid any “wardrobe malfunctions” is essential! Perfect for long or short boots – Whatever your boot preference, you can be sure that these riding jeans will suit it. Long boots fit comfortably over the top, while short boots sit comfortably underneath. Double stitching at hard-use areas – Having a bit of extra support in the places that experience the most wear is invaluable, and will help these jeans last even longer. Crotch may be a little loose – Some users have reported that the crotch area seems a little baggy, though this can be fixed by ordering a smaller size. A great example of the best horseriding jeans, these are perfectly suited to riding as well as all the walking, fencing, mucking out and grooming that goes hand in hand with owning a horse. So there you have it! Jeans are so universal; you can get smart, casual, or a mixture of the two, in just any style you could imagine. You were wondering if you could get jeans to go riding in, and you have found that you can. So which are the best horseriding jeans for you? 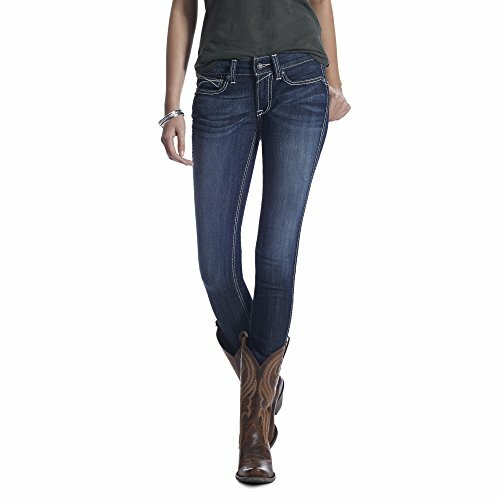 If you want a skinny jean in a mid rise style by a household name that you can trust, go for Ariat Women’s R.E.A.L Riding Mid Rise Skinny Jean. 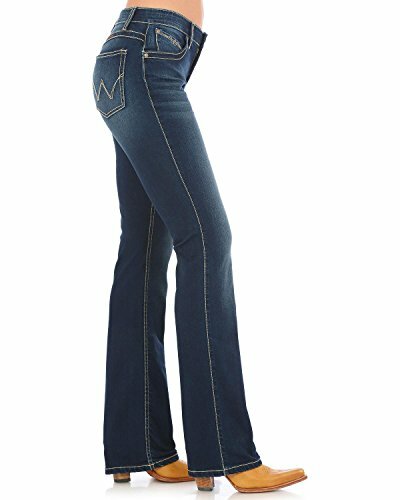 If your style tends towards the wider leg style, then the Wrangler Women’s Ultimate Riding Q-Baby Boot Cut Jean is for you. 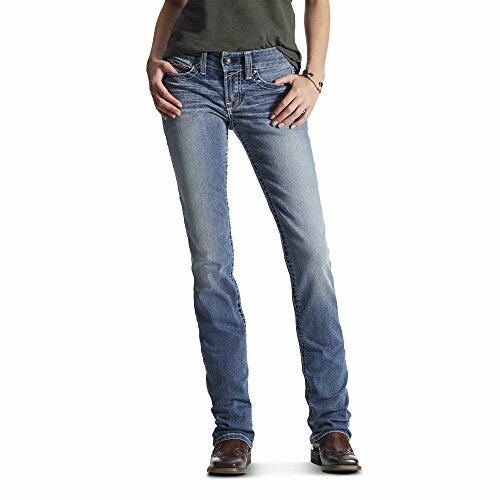 For those after a really strong, well made pair of riding jeans that can be used for all the other horsey jobs, the Ariat Women’s R.E.A.L Riding Mid Rise Straight Cut Jean is your answer. 🙂 I guess I never realized the different types of jeans that might make horse riding more comfortable. Now I have to do some shopping just to see the difference!